The iPad mini was rumoured for a long time before it arrived, but Apple's lightweight, low-cost tablet is finally here. Sitting below the iPad 4 in Apple's line-up, the iPad mini is basically a smaller and lighter iPad 2. The screen has been reduced, but the internal specs and the display resolution are the same. The advantage of it being so similar to the iPad 2 is that all currently available iPad apps will work on it (albeit slightly smaller on the 7.9-inch screen), which means there are over 300,000 apps just waiting to be downloaded. So, where do you start? 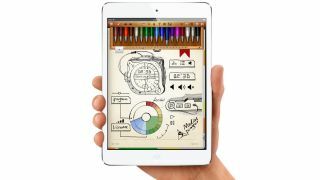 These 15 apps really suit the way the lighter, more portable iPad mini is designed to be used, so there are great apps for reading and fun games for on the go and some ways to play around creatively, among others. Of course, this is just the tip of the iceberg, so for more great choices in every category, see our list of the 230 best iPad apps. The brilliance of GarageBand is that it isn't just for musicians to try out ideas with - absolutely anyone can pick it up and start making music. The Smart Instruments enable you to do something akin to playing real music, even without any talent, but you can always fill in the gaps with pre-recorded loops, to save time. The iPad mini's light weight makes it excellent for reading on, and Kindle offers the best range of ebooks and a great reading experience. It syncs all your books across platforms, so if you have a Kindle device, you can start reading there, stop and continue on the iPad. It's a shame you can't buy books directly in the app, but it's still the best way take in a few chapters. If you like to take notes or sketch ideas on your iPad mini (maybe with an iPad stylus), Noteshelf is a fantastic app. Custom paper designs let you work however you want, and the magnified writing section makes precise handwriting easy. If you use Evernote, the free Penultimate app is also a superb choice. The iPad mini is perfect for watching videos when travelling, but it's limited in the kind of videos it can play. Well, not when you've got AVPlayerHD on it. It enables you to play MKV and Xvid files, and you can send videos to it over Wi-Fi, avoiding the need to sync with iTunes. Brilliant in short bursts or for longer sessions, Joe Danger has you controlling the titular stuntman as he makes his through various hazardous levels. Duck, jump and wheely your way through the courses, and then go back and play it again to get all the collectibles on the way. The free Facebook used to be slow and awkward, but has recently made itself one of the best social networking apps around. It supports almost all of Facebook's big features, such as sharing photos, commenting and Liking, chatting live and playing games. Yes, there's a free Twitter app, but if you want to enjoy the social network without the promoted tweets and with a much smarter interface, Tweetbot is the way to go. It makes brilliant use of gestures to let you quickly see details about a tweet, and offers both a Mute feature for users and the option to silence alerts between certain times. We don't know why some people insist on taking photos with their iPad, but they do, so why not use a camera that gives better creative control than the built-in one?